The term Brachial Plexus Injury (BPI) refers to an injury to the complex set of nerves that control the muscles of the fingers, hand, arm, and shoulder. The nerves originate at the spinal cord and are formed in 3 trunks located in the upper shoulder: the upper trunk from spinal cord segments C5 and C6, the middle trunk from segment C7, and the lower trunk from segments C8 and T1. Other Terms for BPI. Terms used to describe a BPI include Erb's Palsy (an upper trunk injury), Klumpke's Palsy (a lower trunk injury), Brachial Plexus Palsy, Erb-Duchenne Palsy, Horner's Syndrome (when facial nerves are also affected), and "Burners" or "Stingers" (usually associated with sports-related brachial plexus injuries). Torticollis is another term sometimes used in conjunction with brachial plexus injuries. 4. stretching but not tearing of the nerve where the nerve is able to heal itself (a praxis). This a temporary condition where the muscle regains complete function. Denervated muscle can cause imbalances resulting in muscular and skeletal deformities in the elbow and shoulder. Also, the development of the affected arm can be compromised resulting in a shorter limb. Injuries to the Brachial Plexus can result in full to partial paralysis of one or both arms with a temporary or, when the nerve cannot completely heal, a life time injury. While compromising muscle function and the ability to grasp, extend, and reach with the affected limb, the injury can also affect physical appearance. The Brachial Plexus can be damaged in a number of different ways including accidents involving high impact conditions (automobiles, motorcycles, snowmobiles, sports) but most brachial plexus injuries occur during birth with a condition called Shoulder Dystocia (SD). The baby’s shoulder becomes “stuck” against its mother’s pubic bone changing the otherwise normal delivery into an emergency situation. Various SD maneuvers may be used to complete the delivery; but, in the process, excessive force can be applied to the baby’s neck and head resulting in stretching and/or tearing of the Brachial Plexus nerves. 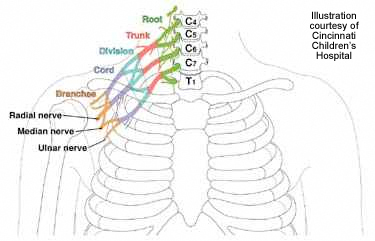 More than one Brachial Plexus trunk can be injured in any of the above conditions, resulting in unique set of nerve injuries for each individual. Thus, diagnosis of the injury requires a careful neurological examination by a brachial plexus specialist to determine which nerves have been affected and the severity of the injury. Such diagnosis should be completed as soon as possible. Brachial plexus injuries are treated with neurosurgery to repair damaged nerves (primary surgery), surgeries to transfer tendons and muscles thereby improving functionality (secondary surgery), physical therapy (PT) to improve strength and range of motion, and occupational therapy (OT) to deal with issues of every day living. Primary surgeries are usually performed 5-12 months after the injury when it is apparent that the damaged nerves are unable to heal themselves. Secondary surgeries are typically done when skeletal and muscular development has matured to the point where surgical intervention has been demonstrated to be beneficial. This may occur in ages from toddler to adult depending on the injury and the proposed procedure. Physical therapy is very important to strengthen partially denervated muscles and other compensating muscles to improve range of motion of the hand, arm, elbow, and shoulder. Also, PT helps to minimize contractures and “freezing” of joints due to under use. Occupational therapy is also important to help with adapting to every day activities such as tying shoes, buttoning clothing, and personal hygiene. Parental participation in PT and OT is necessary to ensure a prescribed regimen is maintained and steady progress is achieved. The importance of having experienced medical experts treat brachial plexus injuries cannot be over emphasized. The treatment objective is to achieve the maximum possible recovery and that could mean a range of surgical procedures and applicable therapies over a period of time, often years. Specialized surgical and therapy techniques are being used for BPI’s with success. However, surgical procedures (both primary and secondary procedures) used with brachial plexus patients are complex; and, like any medical procedure, can have varied results. An understanding of proposed procedures and their results, use of second opinions, and confidence in the medical practitioner are important considerations for parents and injured adults before initiating a course of treatment. Physicians and therapists who have registered with UBPN can be found on the Medical Resources and Therapist Resources pages of this web site. These should be considered as a starting point when searching for medical help as there are likely other regional unregistered qualified physicians and therapists to consider. Also, the Message Boards of the web site are another available resource. The advice and consul of others who have been affected by BPI can be invaluable if only to gain a better understanding of the treatment process. You are here: Home What is BPI?